Ian and Beth Munger, of Blue Line Honey, generously hosted a honey-extracting party at their home for the Southern Adirondack Beekeepers Association, and also very generously invited me even though I’m not a member of that club. 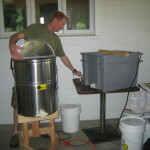 My own club, the Catskill Mountain Beekeepers Club, does have an extracting kit for members to borrow, complete with everything you’ll need for extracting. But I thought it would be great to have some people around for guidance for my first time. The timing also worked well for me. Uncapping Tool: To open up the comb so you can get the honey out. There are many ways of doing this, from an uncapping fork you run along the top of the combs, to a heated (or unheated) knife, to a heated plane. Some people use a bread knife or an electric knife. At the class I took, I was able to use several to see how they work. The heated plane was definitely the easiest, but it’s also, of course, the most expensive. The heated knife is also nice, but be sure you get one that allows you to control the temperature. Not all of them do, and it’s very easy to start burning things. The fork actually doesn’t work too bad, either, if you only have a couple of hives like I do. When I get my own equipment, I’ll be getting a fork, and potentially a knife or plane, depending on my budget at the time. 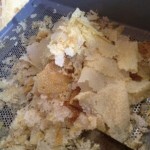 Uncapping Tank: This is just some sort of tub that the wax collects in as you scrape off the top of the comb. 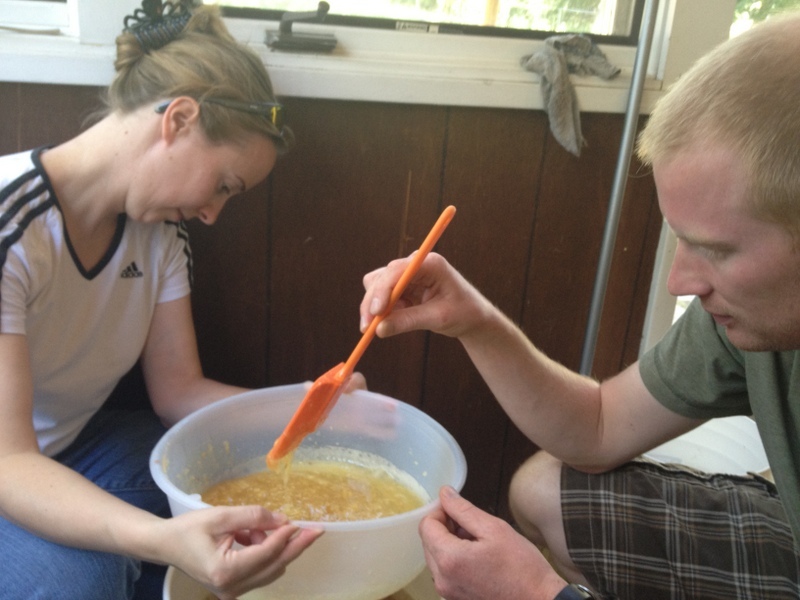 Honey cappings tend to be fairly white wax, so they’re good for making candles and such. 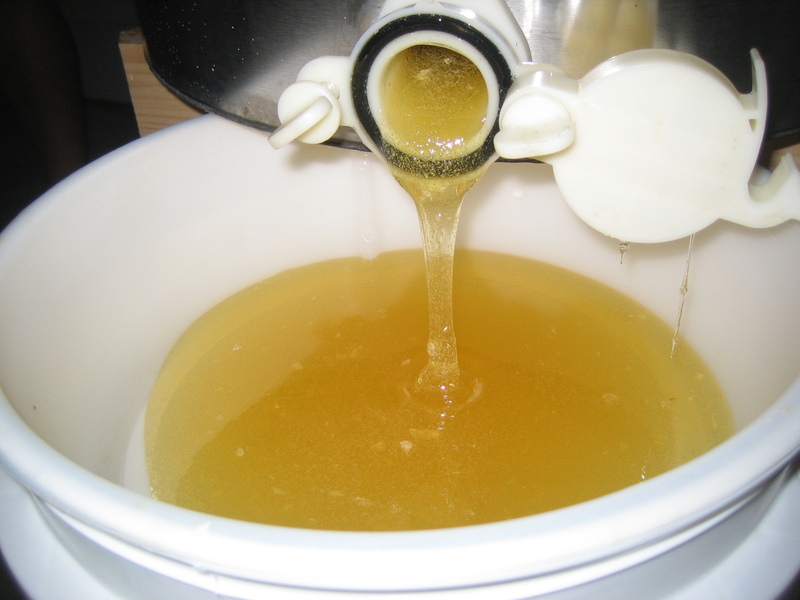 Since some honey goes with the wax, you’ll want a screen on the bottom of the tub to let the honey drain off and a second tub underneath to catch it. Also, some sort of bar across the top on which to rest the frame as you uncap is helpful. I’ll probably be making my own tank out of Tupperware tubs of some sort (assuming I can find something that’s food safe—although this probably isn’t as crucial as it is for the buckets, since I won’t be storing honey in the tank long term). Extractor: Usually steel tubs of some sort that spin the honey out of the frames. There are many different variations, including some DIY versions. Capacities for consumer versions (i.e., not for giant commercial beekeepers) seem to take from two frames at a time up to 6 or 9, depending how much you want to spend. They’re either cranked by hand or motorized. There are also two different frame orientations you can get in an extractor: radial or tangential. Tangentials seem to be smaller and cheaper—but they also take more work and care to not destroy the comb as you spin. The frames are placed standing on end, with the comb facing out/in. When you spin, it spins the honey out of only one side at a time, so you have to flip the frames over to get all your honey. Also, because the centrifugal force from the spinning is from the inside toward the outside of the circle, there’s a decent chance that you’ll break the comb if you spin it too fast or unevenly (meaning you actually have to extract one side of the frames part way, flip and extract the other side, then flip again and finish extracting the first side. With a radial extractor, the frames are still set in on end, but this time like the spokes of a wheel. Again, since the force is from the inside toward the outside, this time it spins the honey out of both sides of the comb at the same time. Also, the force is now along the edge of the comb instead of the face, so there’s much less chance of breaking the comb. Some people say it’s harder to get all the honey out with a radial, especially if it’s thicker honey. For myself, I’m definitely aiming for a radial of some sort. I don’t know how large, and I’m not sure if I’ll go with motorized or not—these things really are expensive. And unfortunately, extractors are in high demand, so the used market is pretty minimal. 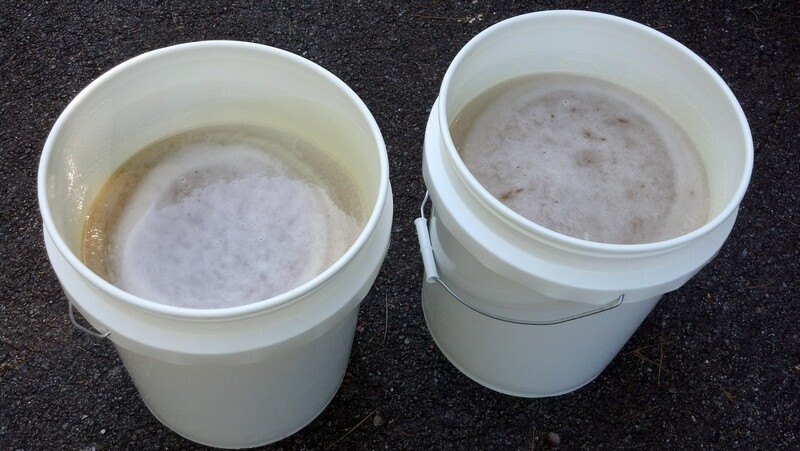 Buckets: Five-gallon buckets (with lids) work quite well and seem to be the standard with beekeepers. Hardware stores often sell these—just be sure to get the ones that are specifically marked “food safe.” Bakeries will often give their empties away for free, as well. I got a bunch from the Price Choppers near us, though they still smell a bit like frosting. Not sure how that will affect the honey long term. Maybe I’ll have vanilla-flavored honey. Strainers: It’s nice to strain the honey right away as it comes out of the extractor, saving you a step later on when you bottle. They make strainers that fit right on top of 5-gallon buckets. Some extractors also have strainers built into them or as an additional piece you can buy. The strainers come in different sizes, depending how much stuff you want to strain out. I’ll probably be using a medium strainer so I don’t strain out all of the pollen bits but still keep out the wax pieces and bee bits. 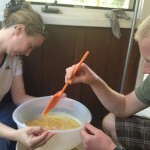 Ok, so the first step in getting your honey is the uncapping. When the bees have evaporated enough water out of the nectar they’ve harvested (down to about 18%), that’s now honey and the bees will put a thin cap of wax on the cell for storage until they need it. 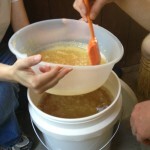 Getting back to the uncapping: To get the honey out, you have to open up those cells that the bees have capped over. Any of the tools I mentioned above will do this. I used Ian’s heated knife, which worked pretty well (video here). It works best if the bees have built the comb deep enough so that it actually sticks out past the wooden frame a bit—that way you can just run the knife along the frame and the caps will come right off in a roll of wax. When the comb wasn’t that deep, the knife didn’t work and I had to resort to an uncapping fork. Once you have both sides of the frame uncapped, it goes into the extractor. I had the pleasure of using Ian’s 6-frame motorized radial extractor, so the actual extracting took no time at all. Six frames at a time, just a few minutes of spinning. 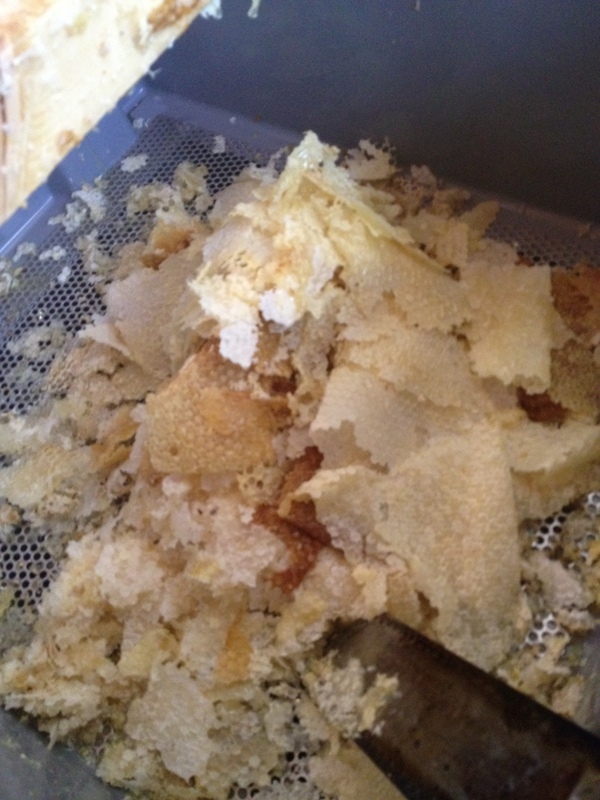 Set a bucket with strainer under the extractor, open the honey gate at the bottom, and PRESTO: liquid gold. 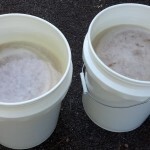 If you’re using the strainers that sit in the buckets, you’ll need to carefully watch when the honey starts getting to the top of the bucket. The strainers take up 2-3 inches of bucket space, so you don’t want to wait until the honey is at the top of the bucket to switch to a new bucket. Not a huge deal if you do, however. 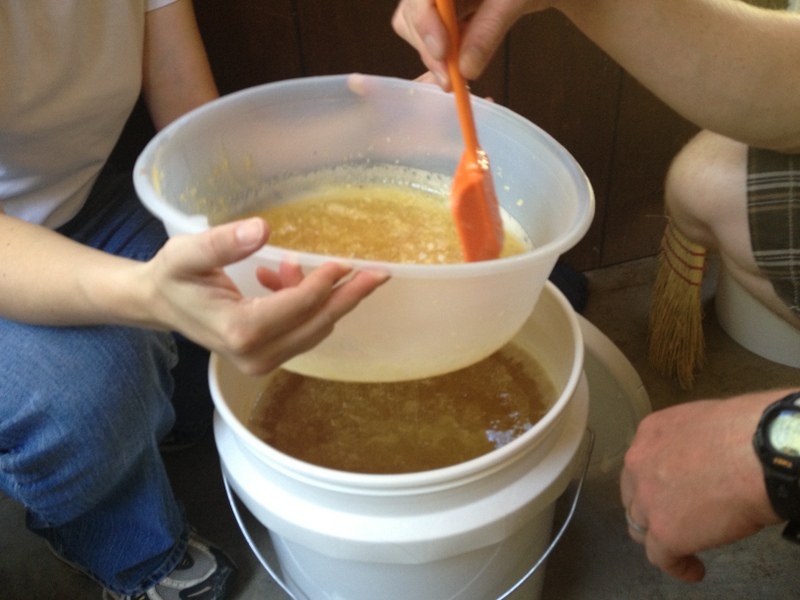 You’ll just have to hold the strainer up and let the honey drain out into the bucket, which I had to do with my second bucket of honey. So after extracting 29 of my frames, I ended up with almost 10 gallons of honey, weighing about 90 pounds. That equates to about 30 quarts. Yum! 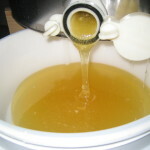 This is very light honey from the spring and summer, both in color and in flavor. I actually prefer a slightly darker honey in flavor, but that usually comes from the fall honey flow occurring now, with goldenrod and asters and such. But a lot of things came together for me to extract now this year, before the fall honey started coming in. 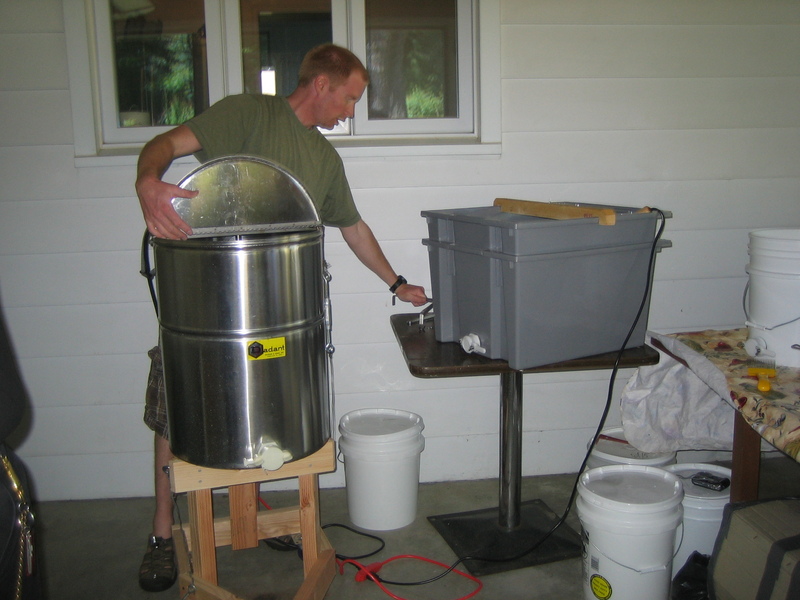 Maybe next year I’ll have my own equipment and will get some of the fall honey, as well.